Legendary rock bad Tom Petty And The Heartbreakers have racked up over four decades in the music industry, and to celebrate they're embarking on a mammoth 40th anniversary North American tour! 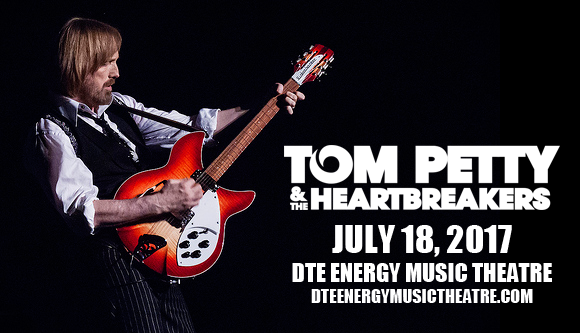 The band will be heading to DTE Energy Music Theatre on Tuesday 18th July 2017, and no doubt they'll be getting the crowd going with all the fan favorites from over the years! Prominent in the heartland rock movement of the late 1970s and 1980s, alongside artists like Bruce Springsteen and Bob Seeger, Tom Petty and the Heartbreakers started their musical career in Gainesville, Florida in 1976. The band has largely maintained its original lineup of lead singer and guitar-player Tom Petty, lead guitarist Mike Campbell, bassist Ron Blair, drummer Stan Lynch and keyboardist Benmont Tench, with a few exceptions. Blair left in 1981 and was replaced with Howie Epstein, who played with the band for the next two decades until 2002, when Blair returned to the band. Multi-instrumentalist Scott Thurston joined the band in 1991, and in 1994, Lynch was replaced by Steve Ferrone. The band is known for its hit singles "American Girl", "Breakdown", "The Waiting", "Learning to Fly", "Refugee" and "Mary Jane's Last Dance". The band's most recent release, Nobody's Children, was released digitally in 2015.